The Copy for iOS iPhone, iPod Touch, and iPad app by Barracuda Networks is a Dropbox alternative with cool e-sign options. This free download from the iTunes App Store has simple interface to organize uploads. The gesture controls are intuitive, but not always accurate with edits to documents and uploads. The registration process for the Copy for iOS iPhone app requires two steps. First, you enter your name, email, and a password. Second, you verify your account via an email sent from Copy. You open to a list of blank fields like the iOS Reminders style interface. As you upload documents, music, photos, and videos, each item has a field. The plus icon in the lower right corner gives you three options – upload photo/video, capture photo/video, and create a folder. It is more efficient to create a folder for each new category. You can tap multiple images from a photo roll for a quick upload. When items are loaded, each field in the list contains a thumbnail, type of file, and date. When you tap an item, it expands and new options appear at the bottom of the screen. The icon with the down arrow opens additional features like copy image to clipboard, open in other apps, sign, send for signature, and print. The signature feature gives several options including signature, initials, insert text, insert today’s date, and insert check mark. You tap the item you want to insert, then tap the preferred location on the screen and follow prompts. The share icon lets you send a public url or a secure link with email verification. These are great tools, but the gesture controls are not consistent. They work smoothly and effortlessly at times. On other occasions, the Copy iPhone app seems to lag, and gestures are less accurate. The line icon in upper left corner opens nice navigation tools. You can move between categories like inbox, favorites, uploads, and account settings. The coolest feature is a grid that groups recently modified files. With a touch, you can pull up all files, documents, images, audio, videos, and presentations. 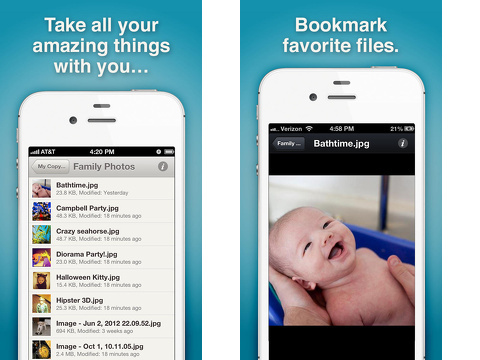 The Copy for iOS iPhone, iPod Touch, and iPad app has an excellent concept, great organization, and nice tools. It just needs to operate smoothly all of the time. AppSafari review of Copy for iOS was written by Jenni Ward on March 5th, 2014 and categorized under App Store, Enterprise, Files, Free, Productivity, Utilities. Page viewed 4542 times, 3 so far today. Need help on using these apps? Please read the Help Page.